2 x SSIP, one for backhaul (MESH SSID) and one for AP (ESSID). Mesh-Smart solved this via time-division transmission method to handle backhaul and AP operations simultaneously. Thanks to its 2 x SSID which now handles that functions of backhauling (SSID 1) and Access Point (AP) function (SSID2) to cater to Wi-Fi client such as laptops and Wi-Fi VoIP handsets. (See illustration above). 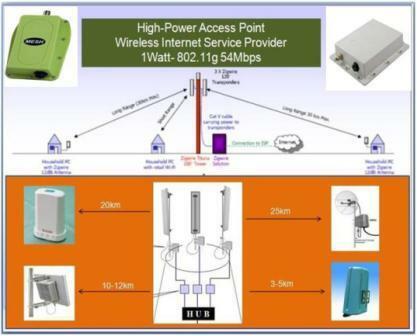 Deploying a wifi-zone for mobile "wireless internet for laptop connection" and wifi-handset roaming in large buildings (hotel, condo, offices, malls, factories) or small outdoor zones such as parks, marinas, small towns and city-streets is now made affordable, easy and cost-effective to deploy. The picture below is an illustration of a fixed-wireless ISP where client-users are being served with fixed CPEs installed on roofs. The beauty of fixed-wireless ISP is that operators can cover a wider area (up to 20-30km) depending on the power and antenna gain of the CPE. One disadvantage of a fixed-wireless ISP configuration is limited roaming for mobile users. "Wireless internet for laptop" connection is much dependent on the laptop's WLAN device. Two-way communication is possible when laptop is near (up to 400m) the base AP but beyond 400m, the limited power of the device is small enough to be heard back by the AP. Although laptops can received signal, it just cannot talk-back to the AP. For two-way communication to be possible, both AP and client must be able to hear each other out. The case is made more difficult for roaming. How will a mobile laptop user be able to get consistent signal from the AP. To be able to do this, the operator has to blanket or saturate a certain area with many APs. Now, operators have the option of adding a lower-tier network. 1. How many Mesh unit can be connected and handled by the AP manager simultaneously? The answer is no limit, so long as the MESH ID and Channel are matched within the connectable area, they can connect automatically, BUT, there is always a 'but', as bandwidth consideration, practically we recommend max. 5 x Mesh for each group, this is the max. best number per our test. 2. How many other units can the software handle within 1 SSID? It is single radio, single antenna but with 2 x SSIP, one for backhaul (MESH SSID) and one for AP (ESSID); I think this question is for how many Mesh unit can be connected and handled by the AP manager simultaneously? The answer is no limit, so long as the MESH ID and Channel are matched within the connectable area, they can connect automatically, BUT, there is always a 'but', as bandwidth consideration, practically we recommend max. 5 xMesh for each group, this is the max. best number per our test. 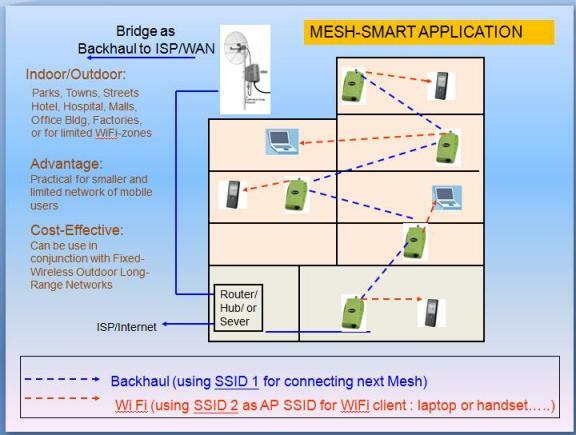 You can easily use MESH SSID and RF channel to form up the MESH groups, and as stated, you may have many MESH groups along the way of backhaul or around the AP tower. And each Mesh groups carries small area and small base of users, so you have mobile servicing while costing is fairly handled. !! 3. How many simultaneous users can it handle in AP part? 4. It uses only 1 antenna?, Can we use extra gain to handle 100 more meters? Yes, only one antenna, it is standard N-female, you can use bigger with higher gain antenna, but please bear in mind that it is for smaller, closed and independent zones, with the RB-2407 (rubber 7-dbi, pig-tail type) it is able to cover upto 500m for client (limited by small client devices); and 1.4Km between Mesh units. 5. ?mb throughput, 54 mbps? 8. Is Mesh-Smart VoIP capable or tested with VoIP? Yes, the unit has QoS, by enabling WMM features (see brochure), it gives priority tovideo/voice packet. 9. Why is Mesh-Smart ideal for connection for mobile wireless internet forlaptop? The advent of hotspot has paved the way for proliferation of WLAN laptops. Now a days, you will always find a WiFi enabledlaptop. There is always a built-in WLAN (802.11) device on every laptop and users are keen on using them for mobile-roaming and wireless internet access. For example, in hotels. Operators are faced with a challenge of how to make wireless internet access widely available for its guest. Mesh-smart is very easy to deploy, cost-effective and reliable even for outdoor deployment. It can even be deployed in parks, marinas, small towns and city-streets to allow mobile-roaming for laptops users. Mesh-smart is good for certain small and independent areas, indoor and outdoor on mobile "wireless internet for laptop" applications. If the operators wishes, they can have many such limited and independant zones along the way of backhaul or around the AP tower. The market reality shows that it will be much more practical for Mesh-smart entry-level series in terms of costing and performance. If you are an operator looking for solutions for mobile wifi users; we urge you to act now.